Ekta Kapoor's Kasautii Zindagii Kay, a decade-long TV show, defined the true meaning of soap operas to us. Shweta Tiwari (who played Prerna Sharma), Cezanne Khan (who essayed the role of Anurag Basu) and Urvashi Dholakia (who was the iconic vamp Komolika) shot to fame because of this show. And now that the head honcho of Balaji Telefilms has brought it back to the small screen as Kasautii Zindagii Kay 2, the entire TV fraternity has come together in support of their most loved mentor. 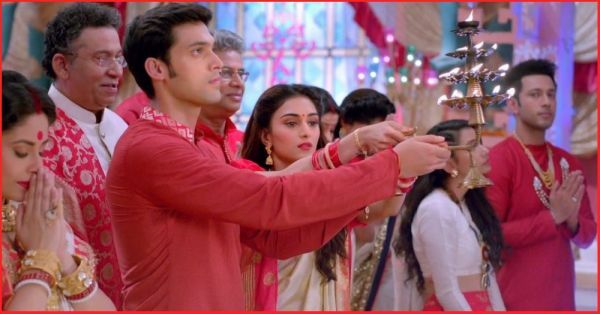 In order to live up to the hype that Kasautii Zindagii Kay 2 created right after its announcement, Ekta and team left no stone unturned in promoting the TV show. Be it keeping us guessing who will play the lead roles to installing statues of Anurag and Prerna covered in a red dupatta in ten cities in India - she has done it all. Ekta sent the internet into a frenzy when she unveiled the promo of the show that had Shah Rukh Khan narrating the love story of Anurag and Prerna. And now that we know that Erica Fernandes is playing Prerna and Parth Samthaan, we were curious to see their onscreen chemistry. The show's first episode aired last night and we can't keep calm. The set was larger than life. It looked like you're watching a movie, not a daily soap. The theme remains the same as it was in the previous show. Anurag and Prerna come from different family backgrounds - Prerna is from a middle-class family and Anurag is from a rich business family. The first episode was a character introduction and didn't really give away the storyline. Parth looked great essaying the role of Anurag onscreen. The episode kicks off with Durga Pooja preparations at Anurag's house. You'll feel immensely nostalgic when you see the iconic red dupatta. Erica's introduction scene was shot at Howrah Bridge in Kolkata. Also, Ekta, Parth and Erica went to the Kali Mandir in Kolkata to seek blessings before the show went on floors. We were super excited to watch Hina Khan play Komolika but her entry didn't happen in the first episode. However, a picture of Hina crawled online and her look is finally revealed. Doesn't she look beautiful in this saree? In an interview with an online portal, on being asked if Hina was the right choice to essay the role of Komolika, Urvashi Dholakia said, "Ekta Kapoor put her trust in me 18 years ago, the same she is doing now on Hina. 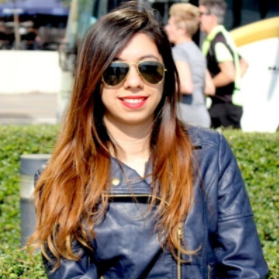 Ekta has an eye for detail. Ekta has an eye for performers. Like she extracted what she wanted from me, I am sure she will extract it from Hina too. The baton has been passed and I wish Hina good luck in all honesty." What did you think about this first episode? Let us know!